On 15 February, the USPTO determined that there was no interference between the Broad Zhang’s invention and the University of California Doudna and Charpentier invention, and the Broad patents will stand. The USPTO decision has impacted the stock value of the three pioneering CRISPR IPOs, in favor of Editas ($EDIT) licensee of the Broad, giving some indirect insights on related core licensing valuation, as compiled by Prof. Jakok Sherkow for Forbes. As recently analyzed by Heidi Ledford in Nature news, the USPTO non-interference decision is not the end of the CRISPR patent story. 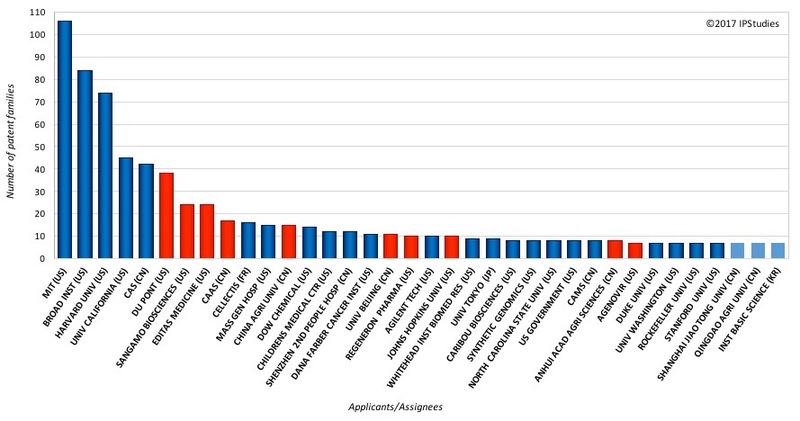 There are more and more CRISPR patents and licensing deals extending beyond the pioneering patents, and emerging efforts to design around some of the early Cas9 claims can be seen in the patent data as well as the licensing announcements. Early February, MPEG-LA presented their CRISPR patent pool initiative to the AIPLA. And the fivefold increase in genome-editing bioenterprise investment as observed just for 2016 is not slowing down. On the investment side, however, concerns are also now raising that Europe may be outpaced in the CRISPR race – at least as far as the patent data shows, as can be seen from our findings on the top applicants worldwide, in which only French incorporated biotech Cellectis (EPA: ALCLS and NASDAQ:CLLS) has secured a significant position.